Opened in January 1995, the 4-star Crystal Crown Hotel Petaling Jaya has fast gained its popularity among the business travelers. It is an ideal choice for those who would like to stay connected and within the hub of the Commercial & Business District of Petaling Jaya. The Hotel comprises of 300 tastefully designed rooms, ranging from Superior to Junior Suites. Adding to this range would be the Executive Summit Floor, where the hotel provides extra space and comfort for guests. The Executive Summit Floor guests will have exclusive access to the Summit Lounge with complimentary beverages throughout the day. 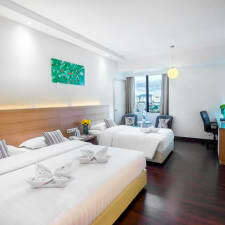 All room guests would also enjoy the free Internet access in their rooms and daily buffet breakfast at the coffee house. For food connoisseurs, there is a Chinese restaurant that serves quality shark's fin, abalone and other Chinese delicacies, Japanese restaurant that offers sushi, yakitori, teppanyaki, sashimi and a Coffee House that serves continental and local cuisines. Guests may wind down after a busy day at the outdoor swimming pool or enjoy a massage at the Health Club.